Flying into the Boston Logan airport for your cruise? Or maybe you simply don’t want to deal with the headache and expense of dealing with parking your car? No matter the reason, if you’re needing transportation from area airports or hotels to the Boston cruise port, then we have you covered. The good news is that in a city like Boston, you have any number of ways to get to the port. The bad news is that with so many options, it can be tough figuring out which way is best for your situation. If you’re overwhelmed with trying to get around the city, don’t worry, we have you covered with exactly how to get from to the Port of Boston without a car, whether you are a solo traveler or heading on a cruise with the entire family. As for the mix of convenience and price, it’s hard to beat transportation network companies like Uber and Lyft. By downloading the app, you can call a car on demand, anywhere in the Boston area or even most of Massachusetts. In general, your fares will be considerably less than using a taxi. For example, an estimated fare on Lyft from Cambridge to the cruise port is just $16 — about half the estimated $30 cab fare for the same ride. Keep in mind that fare is for up to four passengers, making Uber/Lyft our favorite option for everything except the largest groups (6+ people). Combine this low cost with the convenience and high service level associated with Uber/Lyft and it’s easy to see why the services are popular. Since drivers are rated by their passengers and have to have high ratings to keep driving, they go out of their way to provide a good experience. Below, we’ve listed their estimated prices from the areas around town, including the airport. For more on riding with these services to the Boston port, visit this page. Rates below include a 15% tip for cabs. Uber doesn’t use tipping. Lyft has optional tipping. Many people opt to catch a taxi from the airport or their hotel to the cruise port. If you are catching one on-demand, expect to wait a little longer for your ride than you would with a ride-sharing service. That’s because there are about 10,000 Uber drivers in the city, compared to about 2,000 taxi cabs. One area where taxis have an advantage is if you are are catching a ride from the airport. While Uber/Lyft are allowed to drop off at the airport, they have to follow special rules to pick up passengers from there. Lyft chose to not pick up from Boston Logan. Uber only allows some cars to pick up. If you are coming from the airport to the Boston cruise port, then picking up a cab at the airport is easy. Just follow the signs to ground transportation. Elsewhere in the city you can have your hotel call you a cab. Above, we’ve listed the estimated taxi fare from popular areas to the cruise port. Keep in mind these are estimates and they include a 15% customary tip already. The cruise lines are happy to give you a ride to the port… for a price. You can call your cruise line to arrange a package and get the most current pricing. Norwegian Cruise Lines, for example, provides a transfer from Boston Logan to the cruise port for $30 per person, each way. Other cruise lines charge similar prices. For a couple of reasons, we usually suggest going with another option than a cruise shuttle transfer. First, it is expensive. The rates mentioned above are per person, one way. So a family of four is paying $30 each ($120) just to get from the Boston Airport to the cruise port, a quick four-mile trip. Other options like Uber and taxis usually price based on the car, not the number of occupants which makes them cheaper. Second, cruise transfers are extremely limited. In this case, it runs only from the airport to the cruise port… and only on the day of sailing. 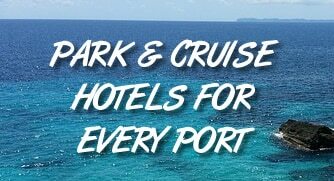 So if you come in early to see the sights or are staying at a hotel in the area, then the cruise line transfer isn’t a viable option. We don’t hesitate to recommend using public transportation to get around the city if you want to save a few bucks. It may take a little time and figuring out, but getting from the airport to your ship can cost just a few dollars. The Massachusetts Bay Transportation Authority (MBTA) operates the Silver Line bus from Boston Logan. This service is free coming from the airport, just board the Silver Line and find a seat. From there, you’ll ride the bus to the Silver Line Way Transfer Station. Here, you’ll exit the SL1, looking for the SL2 that is headed toward Design Center (the SL2 headed to South Station is going the wrong direction for the cruise port). The SL2 bus drops off on Drydock Avenue, just a couple of minutes walk from the cruise terminal. Expect the ride to last about 30 minutes and cost $2.10. You can pay your fare on the bus, but have correct change. For more details on riding the Silver Line, visit this link. If you are staying in the Boston area, it’s still pretty simple to get to the cruise terminal. We suggest making your way to South Station (serviced by the Red Line train). From there, you’ll catch the SL2 bus headed to Design Center.